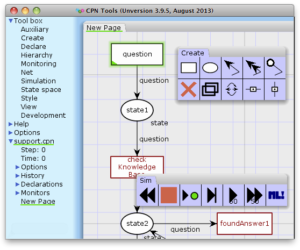 Are bounded places supported in CPN Tools? There is no direct support for bounded places, but it is possible to model bounded places using anti-places. For more information, see the help page for Anti places/limit places. There is no direct support for inhibitor arcs in CPN Tools, but it is possible to model inhibitor arcs. More information is available on the help page; see Inhibitor arcs. Starting from CPN Tools 3.5.1, support for uncolored inhibitor arcs has been added. There is no direct support for queue places, but it is possible to model queue places using List color sets. For more information please see the help page for Queues and stacks. Are real color sets supported in CPN Tools?